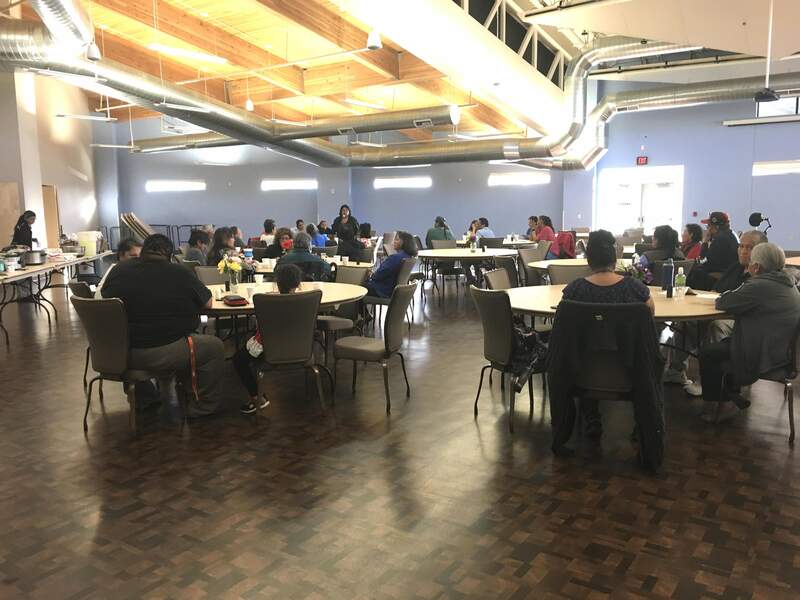 Southern Ute tribal members held an informational dinner Tuesday in Ignacio to educate members about a referendum election being held Thursday that asks members to approve or disapprove the distribution of millions of dollars to the membership. IGNACIO – Southern Ute tribal members head to the polls Thursday to “approve” or “disapprove” the distribution of millions of dollars from a lawsuit settlement to tribal members. If voters approve the referendum, they would receive thousands of dollars each from the remaining balance of the settlement. If fewer than 50 percent of eligible voters cast ballots, or if they “disapprove” the referendum, Tribal Council will keep the money to spend as it sees fit. Dozens of tribal members signed two different petitions demanding a vote on whether the remaining funds should be distributed to the membership. The Tribal Council rejected both petitions, saying they sought to legislate how tribal funds are spent, and those powers are exclusively reserved for Tribal Council, in accordance with the tribal constitution. But recognizing the will of its people, tribal councilors passed a resolution April 4 sponsoring a special election to decide the referendum issue. Interest in the election has been strong among the tribe’s approximately 1,500 members. Voter registration increased from 921 in December 2016, when a run-off election was held for Tribal Council, to 978 eligible voters as of April 25, which was the deadline to register in the referendum election, according to The Southern Ute Drum, the tribe’s newspaper. The tribe received a $126 million settlement in September to resolve a lawsuit accusing the federal government of mismanaging monetary assets and natural resources held in trust by the United States for the benefit of the tribe, dating to the late 1800s. The tribe distributed 60 percent of the settlement late last year, resulting in a one-time distribution of $45,000 to each tribal member, according to a sample ballot published in the Drum. In a letter to members, Tribal Council suggested it wanted to use the remaining funds to pay for a long list of services and programs, including health care, education, housing, employment, new investment opportunities, financial literacy, economic development, repairs to an irrigation project, enhancing museum and cultural resources, records management, youth services and recreation. The fight for the remaining funds exposed hard feelings held by some tribal members toward their leaders, who they accused of acting in secret, ignoring the will of the people, violating its own constitution, intimidating members who speak out against the tribe, and wasting millions of dollars on bloated programs and services. Tribal Council hosted an educational meeting Monday to discuss its plans for the remaining funds in the event the referendum does not pass. The meeting was closed to the public. Tribal members who fought for the right to vote held their own informational dinner Tuesday night. At the meeting, members accused tribal leaders of making the referendum ballot overly complicated to confuse or deter voters. They also touted petitions seeking to recall sitting Tribal Council members, saying they don’t listen to members, allow attorneys to dictate positions, don’t provide fiscal responsibility, and aren’t acting as good stewards of the tribe’s long-term finances.